Water burnouts create good traction - but look at that tire rubber splattered across your race car's quarter panel! What a job. Tired of difficult and time-consuming cleanup after the race? 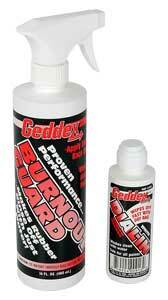 Now before your next race, spray Geddex burnout guard on the body sections you used to scrub. Geddex dries clear and won't harm paint. It becomes a water soluble layer of protection between your hot splatter of tire rubber and the nice clean quarter panels of your car. When you're ready, just rinse down the splattered area with water and wipe away the rubber. Spray Geddex Burnout Guard again, and you're protected for another day at the drag strip! 506 - Geddex Burnout Guard is rated 5.0 out of 5 by 1. Rated 5 out of 5 by Redd from Best product I Have Ever Used I am a repeat buyer of Geddex Burnout Guard, and their Window Dial-In Marker. Put a nice coat of Burnout on your quarter panels before racing starts, and track prep, and rubber will come off easily with hosing and a little soap and water, at the end of the day. The Dial-In goes on easy, and wipes off dry, leaving no imprint on your glass.